Pump up and get back to riding. Air Kit 2 is a manual public bike pump providing cyclists an easy to use airing station when it's needed most. Featuring tough all-steel body, a reinforced rubber and wire mesh air hose, Air Kit 2 is developed for maximum durability and longevity. 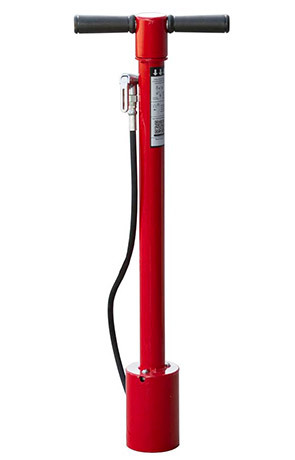 To help ensure hassle free access and safety, the magnetized pump head simply attaches to the pumps body. Designed for the convenience of cyclists, the air pump head fits Schrader and Presta valves, therefore, compatible with all bicycles. Great for high volume spaces like train stations, urban areas, universities or parks, the highly durable Air Kit 2 is the great solution that allows cyclists to air up the tires throughout the seasons. Available in galvanized or the powder-coated finish color options as shown. 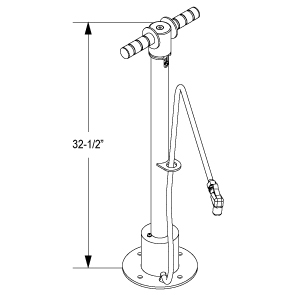 It is recommended for proper access that Air Kit 2 be installed at least 36" away from any obstructions.